Elevated platforms have become increasingly common in rail tunnels. Due to the reduced height difference compared to evacuating a train directly down to the track area, elevated platforms have been proposed as a way of increasing the safety of passengers and personnel. Current knowledge regarding the actual impact of elevated platforms is, however, limited and research in this area is necessary. 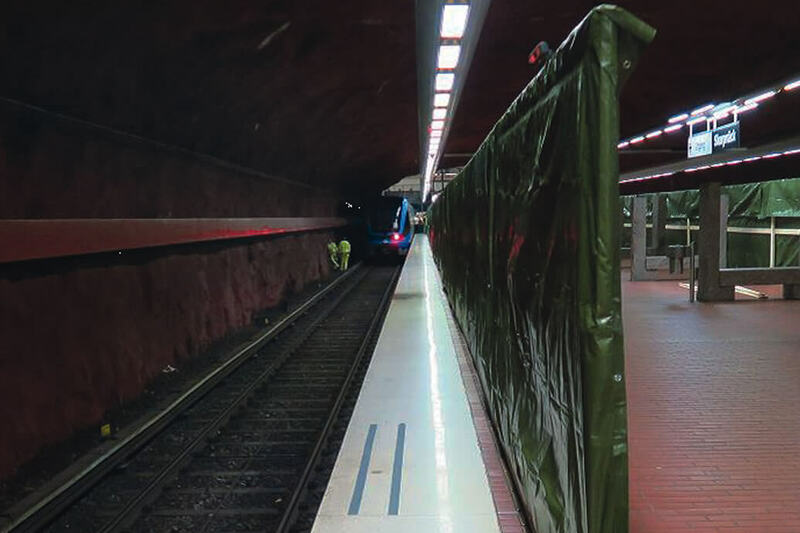 In autumn 2016, an experiment was carried out at the Skarpnäck subway station in Stockholm with the aim of studying people’s behaviour and movements during evacuation along elevated platforms in the event of a fire. The project was a collaboration between RISE and Brandskyddslaget, and was commissioned by the Swedish Transport Administration. The purpose of the experiment was to study human behaviour when evacuating along an elevated platform for different scenarios and the overall project objective was to develop guidelines for fire safety design concerning evacuation along elevated platforms. As the Skarpnäck subway station does not feature an elevated platform, a 93.6 m long screen wall was built along the edge of the platform adjacent to the northern track. By moving the screen wall sideways, altering the distance between the wall and the edge of the platform, it was possible to alter the width of the walkway for different tests. The widths that were tested were 1.2, 1.05, and 0.9 m. Along the first half of the elevated platform, a train was parked next to the walkway. At Skarpnäck subway station the platform is in level with the train floor, making the height difference between the walkway and the track 1.4 m.
A total of 111 people participated in the experiment; 54.6% were men, and 45.4% women. The youngest participant was 18 years old, and the oldest 77. Three people were wheelchair users; one man and two women. The experiment comprised five tests. In Tests 1, 3, and 5, the entire test group moved from one side of the elevated platform to the other. In Tests 2 and 4, the test participants were divided into two groups (A and B); Group A moved along the elevated platform as before, while Group B began inside the train and joined the flow on the platform when Group A passed the train doors. In addition to the five tests, reference tests were conducted in a 30 m long corridor built with two screen walls on the southern end of the platform. Both individual and group tests were performed and the widths that were tested were 1.2, 1.05 and 0.9 m. After the experiment, the participants were asked to complete a survey, which 99% of them did. The results show that the flow rate decreased with the width of the walkway. This was true for all analysis points. The flow rate at the first part of the walkway (which the train was parked beside) was higher than the flow rate at the last part of the walkway (where it was open to the track area) and the flow rate in the reference corridor. The gathered video material and survey clearly showed that the difference in height between the elevated platform and the track area affected the test participants, and so the difference in flow rate between the first and second parts of the walkway can be attributed to the difference in height. Why the flow rate was lower in the reference corridor has not been investigated further within the framework of the present study, but one possible explanation is that the lighting conditions were different. To get an indication of the distribution between the flow on the walkway and the flow out of the train, the merging ratio was observed at the point where group B stepped out of the train and joined group A on the walkway. It showed that, in general, the flow rate out of the train was larger than the flow rate along the walkway. This was true in both scenario 2 and 4. After studying the video material from the experiment, it can be seen that the participants did not walk close to the platform edge (no one used the 10 cm closest to the track area). This was true for the full length of the walkway, independent of the width. 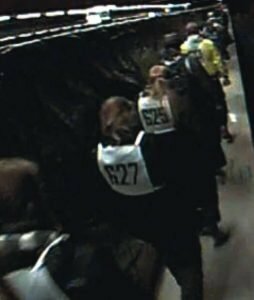 It was also seen that the participants walked closer to the platform edge when there was a train parked next to the walkway than they did when it was open to the track area. When the participants were asked how they experienced their ability to pass others walking slower than themselves, 41.8% answered that they never felt a need to overtake someone in the experiment. In a real evacuation situation due to a fire, for example, it can be assumed that the need to overtake others will increase. This is partly related to the fact that people who are related to one another try to stay together to a greater extent than the participants of the experiment did. The survey showed that some of the participants who chose to keep to their own pace during the test, despite the fact that this separated them from friends and family, stated that they would not have done so in a real situation, where they would have adjusted their speed to stay together. Almost a third of the test participants (32.7%) stated that they did not overtake anyone walking slower than them during the experiment, but that they would have liked to do so on one or more occasions if they had had the opportunity. Together with those who answered that they overtook others – but with some difficulty – during the experiment (14.5%), close to half of the participants (47.2%) stated that they experienced problems related to overtaking others. When there was enough room for participants to be able to walk independently of one another, they generally chose to do so close to the screen wall. Those who knew one another prior to the experiment often chose to walk side by side, while the other participants generally preferred to walk in single file. When it became more crowded, the test participants adopted different formations depending on the width of the footpath. In the tests during which the width of the walkway was 1.2 m, the participants walked in two columns; in those where the walkway had been narrowed to 1.05 m, the participants still walked in two columns but in a staggered fashion, and in the test during which the walkway was 0.9 m wide they walked in single file. Of the three wheelchair users who participated in the experiment, one felt uneasy due to the width of the walkway and/or the difference in height between the elevated platform and the track area. As a result of this, this person only participated in Tests 1 and 2 (in which the width of the footpath was 1.2 m) and did not participate in the tests in which the walkway was narrower. In the survey, this person stated that the width of the walkway was of great importance to a sense of safety. The fact that, in both tests in which this person participated, this person stopped and hesitated at the point at which they passed the end of the train and the walkway opened up to the track area indicates that the height difference also was of great importance. In order to make the evacuation process along elevated walkways more effective, the possibilities for people to overtake others walking slower than themselves, should be further reviewed. Since nearly half of the participants could not, alternatively experienced difficulties, passing others one suggestion for future studies is to investigate how the design of an elevated walkway can be improved to make overtaking easier. The difference in height between the elevated platform and the track area affected the test participants in several ways; the flow rate along the walkway decreased and the width of the walkway was not used to the same extent where it was open to the track area as compared to the part of the walkway that the train was parked next to. The height difference also affected one of the wheelchair users to the extent that this person stopped in the middle of the walkway in two of the tests, and chose to not participate at all in the remaining ones. The suggestion for further study is thus to investigate how elevated platforms can be designed, and with what aids they could be equipped, in order for the difference in height to have less effect. More information on the results is available in SP Report 2017:11.